PFM – Premiata Forneria Marconi is the most famous Italian rock band in the world, and the only one ever to chart US Billboard. PFM started as Quelli, a beat band of the ‘60s featuring Franz Di Cioccio on drums, Giorgio Piazza on electric bass, Franco Mussida on guitars, Flavio Premoli on keyboards. At the end of 1970 the multi-instrumentalist Mauro Pagani joined, and Premiata Forneria Marconi (later abbreviated PFM) started. Their debut was in 1971 at the Teatro Lirico of Milan as a support act to Yes on their first Italian tour. PFM performed excellent covers of avant-garde bands of the time, such as King Crimson, Jethro Tull, etc. This was an opportunity to demonstrate their great talent; they had already on their second appearance – as a support act for Deep Purple – been hugely popular with both audience and critics. The band was signed by the leading Italian record label Numero Uno, and their first single “Impressioni di Settembre” was released. Here is the chronology of 30 discographic years of PFM. 1972 “Storia di un Minuto”. For the first time in Italy, the album of a new band makes it to no.1 in the charts. In the same year the second album “Per un Amico” is released. 1973 “Photos of Ghosts”. The first album for an international audience, with the tracks of “Per un Amico” , plus an unreleased instrumental Old rain and the song Celebration, big hit for the band. PFM is signed by Manticore, the English label founded by Emerson, Lake & Palmer. Lyrics and production are by Pete Sinfield, former member of King Crimson. The whole of 1973 and the beginning of 1974 are spent touring Italy and Great Britain, plus the rest of Europe with Alvin Lee’s Tean Years After. “Photos of Ghosts” charts in US Billboard and is awarded Best Album of the Year by Japanese critics. PFM is also voted as second Brightest Hope – before bands as Supertramp and The Eagles. 1974 “L’Isola di Niente” (English version: “The World became the World”). The first LP with their new bassist Patrick Djivas, replacing Giorgio Piazza. After the huge success of “Photos of Ghosts”, Manticore label decides it is time for a US tour of PFM to promote launch of the new album. “The World became the World” is more sophisticated than their previous album; its suggestive music will allow PFM to enjoy great success in the US tour – as a support act to Poco, Santana, Beach Boys, Allman Bros, ZZ Top and others. Mario Medius, then artistic director for Manticore New York, decides to record the tour. In this pretty casual way, the first official PFM live is born: “Cook”, known in Italy as “Live in USA”. 1975 “Chocolate Kings”. The band welcomes Bernardo Lanzetti as lead vocals and second guitar. PFM tours Japan with concerts in Tokyo, Osaka and Nagoya which are a triumph. They win their first gold disc in Japan. The warmth and enthusiasm of the Japanese audience remains to this day one of the most intense moments of PFM’s career. The audience in the States loves the new band, although the latest album receives mixed reviews – due to lyrics which are a little critical towards the American system. However “Chocolate Kings” reaches the Top 20 in the UK. In 1976 PFM is back to Europe for their 4th British tour. During their concert at the Royal Albert Hall they are visited by Her Majesty the Queen Mother. When PFM returns to Italy, Mauro Pagani quits the band: it is time for new creativity and new directions. 1977 “Jet Lag”. This album is more orientated towards jazz-rock. One more member is added to the band: the stunning violinist Greg Bloch. “Jet Lag” is a pun between the real meaning – the change of time fuse – and a symbolic one: the cultural gap PFM felt touring the US. The Illustrated New Musical Express Encyclopedia of Rock features for the first time an Italian band – PFM of course -, and “Jet Lag” album cover (brainchild of Di Ciocco) is featured in the Illustrated History of Rock Album Covers, known for including the best album covers of the rock world. “Jet Lag” is also the starting point of PFM’s own record label ZOO Records that will soon become an important talent-scout for Italian rock talents. 1978 “Passpartù”. The band gets more acoustic in this album and goes back to using Italian lyrics. This album features lyrics by the songwriter Gianfranco Manfredi, and the album cover is by the unknown Andrea Pazienza – who later becomes one the most important Italian illustrators. 1979 “De Andrè & PFM in concerto”. This project originates from an idea by Franz Di Cioccio, to bring together the most famous Italian rock band ever, and one of the most famous Italian songwriters ever. 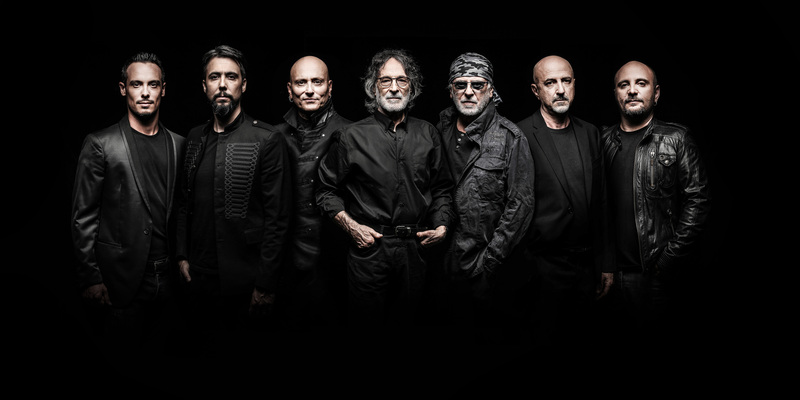 PFM’s arrangements of Fabrizio’s songs give them an entirely new colour: their tour together (also featuring Roberto Colombo keyboards, and Lucio Fabbri violin) is one of the most successful ever for PFM and De Andrè. The following year “De Andrè & PFM in concerto – Vol. 2” is out. This experience causes PFM to start creating more poignant song-lyrics. 1980 “Suonare Suonare”. “Symphonic” rock is left behind in this album, where they use more rougher metropolitan sounds. The album has a subtitle: “8 stories in words and music to express, communicate, suffer, enjoy, and play” and is autobiographical of the band members. Lucio Fabbri is now a member of PFM. After the recording of this album, Flavio Premoli quits the band. In live performances Franz Di Cioccio becomes the front-man, so Walter Calloni is the drummer. 1981 “Come ti va in Riva alla Città”. This is a more political album, dealing with the difficulties young people face in trying to adapt to society, and talks about how society tends to homogenise everything and everybody. 1982 “Performance”. Third live album for PFM. Once more the great energy of the band is all there; and once more it is recorded live from only one concert without cut and paste. 1984 “PFM? PFM!”. A thoughtful album also featuring “Capitani coraggiosi”, a piece that will enjoy great success in Italy and abroad, reaching new audiences from the usual PFM one. 1987 “Miss Baker”. For the first time, PFM use winds in this album. After this experience, the band decides not to tour anymore: each member follows his own personal path, even if officially PFM has not disbanded. In the 10 years before the reunion, two anthologies are released: “L’album di…. PFM” in 1988, and “PFM – i grandi del rock” in 1993. A video is also available featuring a ‘70s show of the band on the Italian television (“Impressioni 20 anni dopo”). 1996 “PFM – 10 anni live 1971-81”. This is a wonderful 4-CD anthology featuring rarities from 10 years of PFM concerts all around the world. This is released together with the Franz Di Cioccio’s book “PFM – due volte nella vita” – a biography of the band in order to prepare for the forthcoming reunion. 1997 “Ulisse”. The reunion album with the original band members Di Cioccio-Dijvas-Premoli-Mussida. It encompasses the wide-ranging musical and personal inputs the band members have had in the past 10 years. Again PFM is back on top: a gold disc is given to PFM for this album. 1998 “www.pfmpfm.it (il Best)”. This is a double live album following the highly successful Italian tour of “Ulisse”. PFM is charting again. 2000 “Serendipity”. A new millennium and new sounds for PFM. Corrado Rustici produces the CD and some of the most important Italian poets and songwriters are commissioned to write lyrics. This album reaches out to new horizons. As PFM members say: “This was always our way to work out music: to discover something new while searching for something else. To reach new creative results springing from any part of our musical and personal experiences”. “K.N.A. (Kaleidoscope Neutronik Accelerator)” is the single, which is a mix of concentrated energy and dynamic musical innovation beyond any trend. January 2001 sees the band once more on tour, showing that they are still 20-year-olds at heart. 2002 “PFM Live in Japan 2002”. This is the 30th anniversary of their first PFM recording. Iaia De Capitani is the new manager of the band. This is celebrated with a world tour starting in Japan in May 2002: seven concerts are sold-out and the last Tokyo date is recorded and videoed. This material becomes a DVD (the first one for the band) and a double live CD. To launch the new CD and DVD is “Celebration Day”: a concert in Milan to celebrate PFM’s birthday, featuring special guests linked to PFM’s history. A capacity audience of 4,000 attends this phenomenal concert with Cristiano De Andrè, Mauro Pagani, and Peter Hammill. Mr Hammill actually wrote the lyrics for – and sang – “Sea of Memory”, a bonus track enclosed in this double CD. 2003 PFM starts their “neverending tour”, being constantly requested in Italy and worldwide for live performances. On August 29 in beautiful Siena’s Piazza del Campo the band meets for a full concert their previous member Mauro Pagani. The show later became a DVD. Florence 13th & 14th January: a great 25th anniversary since their historic tour of 1979 with the poet Fabrizio De André. PFM starts the tribute tour “PFM canta De André”. 2005 January 14th is released “Piazza del Campo” CD & DVD live, recorded in Siena. In July start the world tour in Canada, USA, Mexico and Brasil. October: new cd called “Dracula”. May: world tour in Corea e Japan, followed by summer Italian tour. September/October: Tour in USA & Mexico. November: release of the new CD-DVD STATI DI IMMAGINAZIONE, followed by a theatre tour. February 17th -18th BUON COMPLEANNO FABER 2007 in Rome and Milan with many guests. Then, summer tour and theatre tour with all their 3 different productions. February 16th BUON COMPLEANNO FABER 2008 in Genoa with several Italian and international guests. November/December; tour in Canada, USA, Mexico and Guatemala. February 16th BUON COMPLEANNO FABER 2009 in Milan with many Italian guests. April 27th Releasing of “A.D. 2010 LA BUONA NOVELLA”, remake of the famous Fabrizio De André’s album on Apocryphal Gospels: the poet met the band in 1970, when the original “La Buona Novella” was released and when the band’s name was “I Quelli”. Today, 40 years later, PFM decide to re-arrange that concept album, covering it with a new musicality and even introducing new features. PFM made his debut in the ambitious project PFM CLASSIC with a symphony orchestra. PFM plays Mozart, Saint Saens, Dvorak, Prokofiev, Rimskij Korsacow, Verdi, Rossini, etc. Autumn-winter tour to celebrate the 40 years from the first two LP “Storia di un minuto” and “Per un amico” .